A stylist at work, carefully considering her client’s facial features to deliver the best results. Stylists are always in demand and the field is constantly growing. A stylist is usually either a hairdresser and cosmetologist and goes through extensive training to learn how to replicate the latest in fashion designs and how to create their own designs for their clients. A stylist, also known as a cosmetologist, is a person who specializes in styling and beauty services. Some may focus on makeup, others on hair and still others will focus on both areas. Stylists will often work for hair salons or other general beauty salons and may specialize in makeup for special occasions such as proms or weddings. A stylist can also work on their own if they gain a sufficiently positive reputation. Stylists are trained heavily in the methods used in the industry. Cosmetology is extremely precise. Clients prize their appearance and it is often necessary for cosmetologists to practice their art so they will not make any mistakes when working on their clients. A stylist will often work under another stylist before actually performing work themselves. A stylist can potentially start by simply prepping the clients by washing their hair and then eventually graduate to cutting. Stylists may then move on to coloring and will slowly add more advanced work under the instruction and supervision of more advanced stylists. Stylists that specialize in makeup rather than hair will also have on-the-job training and will often do makeup for special occasions. The stylist will need to be precise, prompt and organized and may be called upon to do their work on-site. This is especially true in the case of weddings, where the stylist will often go to a specific area to do the makeup for the bride and her bridal party shortly before the actual proceedings. Stylists will usually go to cosmetology school, though it’s not always necessary. Cosmetology is usually a two year degree program but there are also accelerated courses. The program often includes practice on other students or on volunteers, and many cosmetology schools offer inexpensive hair cuts and styling for the benefit of their students. Once a cosmetologist has finished school they will complete their training in a salon. Salons regularly train new stylists and it usually isn’t overly difficult to secure a position. A cosmetologist usually works on an hourly basis and also collects tips. Some cosmetologists lease out their areas from the salon and keep all of their profit. Others work directly for the salon and still others may open up their own salon and hire their own stylists and colorists. As mentioned by the Bureau of Labor Statistics, a cosmetologist usually needs to be licensed before they can begin working on clients. How Do You Advance as a Stylist? Most stylists eventually want to own and run their own salon. Until then, a stylist can work with a salon that allows them to lease the space and keep their own revenue. O*Net Online lists the fields of styling and cosmetology as one that has a particularly bright outlook. 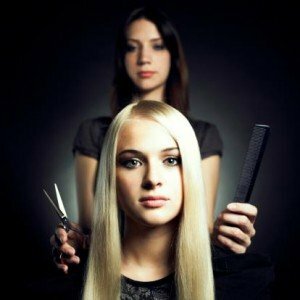 A stylist can usually open their own salon once they have developed a reputation among those within their region. As the stylist’s reputation grows, their salon can grow as well. Stylists that do particularly well can hire other stylists to work within their salon. Those that work primarily with makeup can also consider moving into the area of skincare specialization or becoming an aesthetician. This requires additional schooling but can lead to higher pay and more opportunities overall.